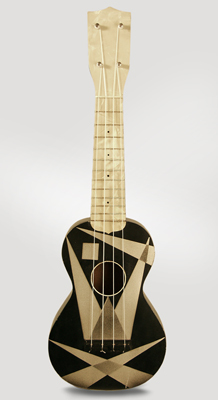 'Pearlette Art Moderne' Model Soprano Ukulele, made by Harmony, c. 1930, made in Chicago, stenciled paint finish, birch body; poplar neck. Overall length is 20 in. (50.8 cm. ), 6 3/8 in. (16.2 cm.) wide at lower bout, and 2 1/2 in. (6.4 cm.) in depth at side, taken at the end block. Scale length is 13 in. (330 mm.). Width of nut is 1 1/2 in. (38 mm.). A very nice, all original instrument-the fancier model of the Art Moderne series with a pearloid headstock and fingerboard veneer. Some light finish chips here and there, and a small solid crack repair to the side by the neck heel. Overall a good sounding and playing uke, a lovely example of this deco-era classic. Excellent - Condition.